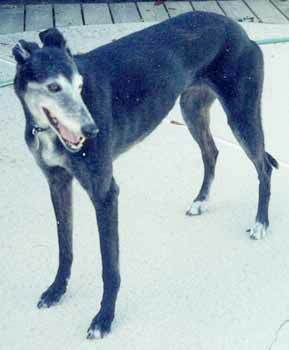 Mandy is an 11-year-old black with some white markings, female greyhound. She was found as a stray in the Euless area. Mandy is a very affectionate, sweet, petite girl with such a soft and velvet feel to her coat. 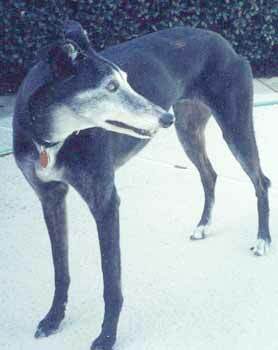 She is definitely good with other greyhounds and is small dog safe also. If you are looking for a senior dog to add to your family, Mandy would be an excellent choice. Mandy has adapted quickly to her foster home. She loves o play with her foster greyhound brother and foster westie sister. They all share their toys and it is hard to believe Mandy is 11 years old. She always has the energy to play, go for walks but also enjoys her sleep time too! Mandy has such a distinguished look about her. My husband says she looks something like Lily from the Munsters. She has lots of love and affection to give and will make someone very happy in her forever home.